“…..Much previous research into the nature of North Korean political headship has focused on Kim Il-sŏng’s overt masculinity, a theme asserted by much of the local political narrative through its envisioning of the elder Kim as not only “the Great Leader” but as its founder and “Father”. This may have seemed an easier task in the era when North Korea occupied a geo-political niche as an aggressively anti-colonial independent force. Pyongyang sought to play off the twin poles of world communism, the Soviet Union and the People’s Republic of China (Cumings 1992) and engaged in a loose alliance with the Non-Aligned group of nations. Following this strategy, North Korea was relatively successful in diplomatic, economic and institutional terms (Szalontai 2011), although in the years following Kim Il-sŏng’s death success became more difficult to achieve. Kim Chŏng-il was bequeathed an essentially stagnant, decrepit nation caught in a cycle of degradation at a time of radical geo-political shift in which its position as lightning-rod of Liberationist and anti-colonial politics was becoming unsustainable and impossible (Kim, Sung-chull 2012). This second Kim was in no way equally blessed with the apparently easy charisma and anti-Japanese guerrilla authority of his father. Thus maintaining the previous narrative of legitimacy became increasingly difficult (Post 2008). B.R. Myers has recently asserted that the past cultural, presentational and media production of North Korea conceived of Kim Il-sŏng as not simply a patriarchal, fatherly, male figure, but also a more conceptually androgynous figure. This assertion has thus broken the previous analytic stasis arguing that in some ways Kim Il-sŏng is presented as a mother to the nation. Myers thus fractured the narrative of exclusive monolithic North Korean maleness (Myers 2012). As radical as Myer’s claims have been in the context of contemporary North Korean scholarship, this diffusion and liminality of gender held by Pyongyang has manifested in concrete practical forms, both historically and in our era. The key example which this paper utilises is that of Kim Jŏng-suk, mother of Kim Chŏng-il, first wife of Kim Il-sŏng and feminine lightning rod for North Korean historical legitimacy. Like much of North Korea’s pre-Liberation history, Kim Jŏng-suk herself is a character difficult to place definitively within a conventional narrative. Even within North Korean historiography Kim Jŏng-suk takes some time to rise to the top of the revolutionary pantheon. Initially Kim Il-sŏng’s mother Kang Pan-sŏk was portrayed as the key female actor within the revolutionary period. Kang Pan-sŏk’s nationalist utterances such as “Only when one has his own country, can he enjoy a decent life. Therefore we must fight to win back our country” (Women of Korea, 1969: 12) and her revolutionary activities with Kim Il-sŏng’s father Kim Hyong-jik seem independent and forceful enough to describe her revolutionary status. However, Kang Pan-sŏk can also be seen as a cipher of authoritative filial connection, useful in linking an earlier nationalist era of resistance during the Japanese annexation period with Kim Il-sŏng and his era of guerrilla struggle against colonialism. This connection is made fairly explicit in the narratology: “Mother Kang Pan-sŏk trained Comrade Kim Il-sŏng from his childhood to have patriotism and indomitable spirit of a revolution…braving all sacrifices” (Women of Korea 1969: 12). Kim Il-sŏng’s authority and legitimacy established, Pyongyang narrative moves from his mother, childhood and the spaces of colonial Chosŏn and begins to focus on the activities of later revolutionaries outside Chosŏn, in Manchukuo and on the later Sino-Korean border. In the 1970s the importance of Kim Il-sŏng’s son and eventual successor, Kim Chŏng-il, started to rise. In the light of this, a feminine figure had to be found to underpin and triangulate the filial and revolutionary legitimacy of this younger Kim. This legitimacy also had to be closer to the geographic location of the historical narrative of Kim Il-sŏng during the period, to offer equally revolutionarily authentic site for his birth. For a period, the revolutionary archetype centered on the figure of Lie Ge-sun, another female member of Kim Il-sŏng’s retinue. The narrative recounts that “one day she was arrested by the enemy and put to severe torture of all sorts. But she held fast to her fidelity to the revolution, resolutely defending Comrade Kim Il-sŏng’s great revolutionary ideas” (Women of Korea 1971: 35). While in North Korean history such fidelity and sacrifice can be useful, Lie’s participation in this narrative is fleeting. This is also true of characters from later accounts such Cho Ok-hi, a female North Korean combatant during the early months of the Korean War. Given their rather brief part in the narrative such figures were difficult to use as fulcrum for the underpinning of any revolutionary authority. Perhaps it is her apparent in historical terms during the guerrilla period that supports a coherent utilisation of Kim Jŏng-suk as the primary female protagonist. While Kim Jŏng-suk personhood appears as coherent in this era, she still plays only a fleeting role in the wider North Korean political development. Accordingly, just as it is a contested question when and where exactly Kim Il-sŏng and his guerrilla band operated during the colonial period, so are Kim Jŏng-suk role, position and personhood transient and liminal in historiographical terms. Having died early in North Korean national narrative, Kim Jŏng-suk now plays a mythic role. When it comes, however, to her activities in and around Mt. Paektu , the existent North Korean rhetoric is determined to place Kim in an earthy, categorically real realm of contest. “A saying has it that a man resembles his birthplace; it’s true to say that Kim Chŏng-il resembled Mt. Paektu. The mountain fascinates people with its majestic appearance – the enormous lake at its summit and its chain of high peaks – and its mysterious natural phenomena, all these are symbolic of the traits and mettle of Kim Chŏng-il, who possesses a far-reaching ambition, outstanding wisdom, firm courage, strong willpower, great magnanimity and perfect leadership ability…” (Biography 2005: 2). This is the masculine gendering of Paektu landscape that we are used to, projecting the strength, commitment, endurance etc. of the Kim dynasty onto its topographical features, coupled with historical recantations of the activities of Kim Il-sŏng and his Anti-Japanese guerrilla band. However, if readers were to visit the primary memorial site commemorating the pre-Liberation guerrillas’ contribution to North Korean historiography in Pyongyang, the Revolutionary Martyrs Memorial, they might be surprised to note that the primary memorialised individual at this site is neither Kim Il-sŏng nor any male member of his band, but instead Kim Jŏng-suk. Kim Jŏng-suk was born in 1917 at Osa-dong, North Hamyong Province and apparently possessed a “…patriotic and revolutionary family background…” that “…motivated from her early years to grow up into a great revolutionary…” (Biography 2002: 10). Within earlier accounts of North Korean historiography, Kim Jŏng-suk was initially, as we have seen, almost entirely absent. However, later presentations of Kim appear diffuse, made more distant by a packed narrative of revolutionary developments since liberation, the tumultuous Korean War and by the passage of the Cold War. However since 1984 and the rise of Kim Chŏng-il to full institutional power, representations of Kim Jŏng-suk within pre-North Korean anti-colonial struggle appear anything but distant. Instead, Kim Chŏng-il mother is utterly tangible and determinedly real. “…the child’s crying echoed through the valley, marking this eternal farewell between the brother who must have shed tears of blood hugging his son struggling not to be parted from his aunt, and the sister who had to go to the guerrilla zone hearing the heart-rending cry of her dear nephew, both taking the path of struggle, ready to sacrifice their family and everything else for the revolution…” (Biography 2002: 20). The narrative argues that the decision to take a “path of struggle” was taken by Kim Jŏng-suk not in defiance of, but collectively with her brother, and the sacrifice mentioned is as much hers as his, with her brother relinquishing his right to her services and her role as a care-taker of his son. Nevertheless, we would assert that here for the first time the authors in their articulation of a “path of struggle” present a topographic element through which such a metamorphosis occurs. Kim Jŏng-suk would continue down this path, both transforming and being transformed by it. She will move further and further away from the terrains of familial convention, becoming a warrior upon joining the KPRA in September 1935, capable of the statement: “With this rifle bearing the blood of the revolutionary forerunners and the people’s desire for national liberation, I will be faithful to General Kim Il-sŏng to the last moment of my life. I take this one rifle as one hundred rifles and will shoot one hundred bullets to take revenge on the enemy…” (Biography 2002: 45). The “path of struggle” taken by Kim Jŏng-suk will later lead her towards the mythic space of Mt. Paektu, where she will transform into a Revolutionary Mother. In the terms of Propp, Japanese occupation is a ‘trouble’ pushing Kim Jŏng-suk away from home, away from her ‘normal’ feminine life and occupations, associated in the current narrative with peaceful and happy existence, though darkened by the presence of ‘Japanese landlords’ ( Propp 1998 : 145). Mt. Paektu, on the other hand, will become for this new Kim Jŏng-suk a space of struggle, hardship and endeavour. There are equally a great many statements from and about Kim Jŏng-suk of a similarly robust and blood curdling nature, suggesting a woman quite distant from patriarchal representations of the feminine or the maternal. When it comes to the period of actions on Mt. Paektu itself, however, the narratives attempt to combine this acute militaristic rhetoric with more tempered, caring behaviours (though still within the context of the guerrilla campaign). A key example for this is the incident at Naitoushan. “One night while the battle was still raging, she [Kim Jŏng-suk] was climbing a mountain with a woman guerrilla carrying a jar of hot water for the combatants when she slipped on some ice and tumbled down a slope. The woman guerrilla hurried down, and found that though she had lost consciousness, she was holding the water jar tightly. Her affection for her revolutionary comrades and fighting spirit encouraged the guerrillas to endure cold and fatigue in the battle…” (Biography 2002: 49). This Naitoushan incident represents the first instance of Kim Jŏng-suk exhibiting maternal qualities of love and care, expressed through the application of fortitude, strength and courage. Here Kim Jŏng-suk’s militaristic and revolutionary self encounters and engages the landscape of the field of battle, while simultaneously revealing maternal virtues: In the quotation Kim Jŏng-suk holds tight to the hot water in her care meant for her colleagues and comrades, in-spite of her unconsciousness. Further to this, Kim Jŏng-suk in the midst of the guerrilla campaign is given charge of a group of children. Of course, in spite of the difficulties Kim Jŏng-suk demonstrates her battle hardened, revolutionary resilience and her feminine, maternal abilities and does so entirely on her own terms: “Kim Jŏng-suk herself dug out grass roots from the snow-covered ground and picked berries to feed the children. Many times she had only water for her own meal…” (Biography 2002: 51). The terrain of Mt. Paektu itself was not reached by the guerrillas until the summer of 1936. After crossing “boundless primeval forest” and the Amnok River (an important episode in the narrative of Kim Il-sŏng’s ascent to power – (Kim Il-sŏng 1992), the text announces “…the grand spectacle of the snow-capped ancestral mountain, the symbol of the long history of Korea…”. Kim Il-sŏng himself even lays out the narrative terrain to follow in his conversation with Kim Jŏng-suk: “…This wonderful natural fortress stretching from the summit of Mt. Paektu…will provide us with a theatre of our sacred future struggle…” In response, Kim Jŏng-suk considers the recent past as a topography of difficulty, presumably for the guerrillas and revolutionaries, one ripe for transformation: “Bearing his teachings in mind, she looked back upon the road the Korean revolution had traversed to Mt. Paektu. It was indeed a course of a bloody struggle, which had to break through a forest of bayonets” (Biography 2002: 61). Having arrived within this sacred terrain, Kim Jŏng-suk embeds her revolutionary femininity and political commitment through a performative act of theatrics. Its ‘constructed remains’ are key to the contemporary North Korean touristic experience of revolutionary space at Mt. Paektu (Rodong Sinmun 2014) and provide further evidence for the Kwon/Chung charismatic/theatric thesis (Kwon and Chung 2012): “When the construction [of the camp] was complete, Kim Jŏng-suk peeled bark from trees in the surrounding area and wrote meaningful slogans on them: “A General Star has risen on Mt. Paektu”, “Oppose the predominance of men over women. Long live the emancipation of women! Humiliated Korean women, wise up in the struggle against the Japanese!” (Biography 2002: 62). In Southern myth, Mt. Paektu appears as a space of contest between female Woman of Heaven and male Bodhidharma. The heroine of Northern legend, Kim Jŏng-suk, does not demonstrate similarly hostile attitude toward her male counterpart, her husband and general Kim Il-sŏng. Their relationship instead is one of love, harmony and mutual support. However, the motif of female-male dispute is not absent entirely from North Korean narrative: here we see Kim Jŏng-suk writing on the trees of sacred Mt. Paektu “Oppose the predominance of men over women!” In doing so, Kim Jŏng-suk allies herself with all women against all men – or at least against those men who intend to dominate women. Through this Kim establishes herself not only as a heroine of Mt. Paektu or of Korea, but as a ‘protector and representative of all women’. Coupled with these demonstrative theatrics Kim Jŏng-suk’s behaviour in the “natural fortress” exhibits both feminine and militaristic qualities, sometimes entirely merging the two, constructing an image of ‘militaristic femininity’. A key example is her maternal support of the guerrilla Ma Tong-hui. Described in semi-comic tone, Ma apparently “…had flat feet…this made it difficult for him to act in concert with the other guerrillas…he was too exhausted to notice that his trousers were falling down…” (Biography 2002: 65). In-spite of his obvious lack of utility to an active band of revolutionary guerrillas, Kim Jŏng-suk seems determined to nurse the inept soldier to usefulness: “Kim Jŏng-suk walked together with him on marches, to encourage him, and helped improve his marksmanship…” (Biography 2002: 65); she also mended his clothes (Biography 2002: 66). Such maternal support is fundamental to the narrative of Paektu and primarily important so far as the contemporary transformation of Kim Jŏng-suk into militaristic saint is concerned. Actually, in teaching the young soldier to fight and providing him with a role model for emulation, Kim Jŏng-suk functions as much as a father as a mother. In this sense, Kim Jŏng-suk shows androgynous qualities of both female and male, similar to Kim Il-sŏng, in B.R. Myer’s conception (Myers 2012). Besides demonstrating her ‘militaristic femininity’, the episode with Ma Tong-hui also portrays Kim Jŏng-suk as a martial arts teacher: she coaches Ma Tong-hui to become a good fighter. She is also portrayed as a teacher of ‘Revolutionary Truth’ to Ma, inspiring him with her personal example. Moving to similar geographic and topographic terrains, the text recounts an important event of March 1940. 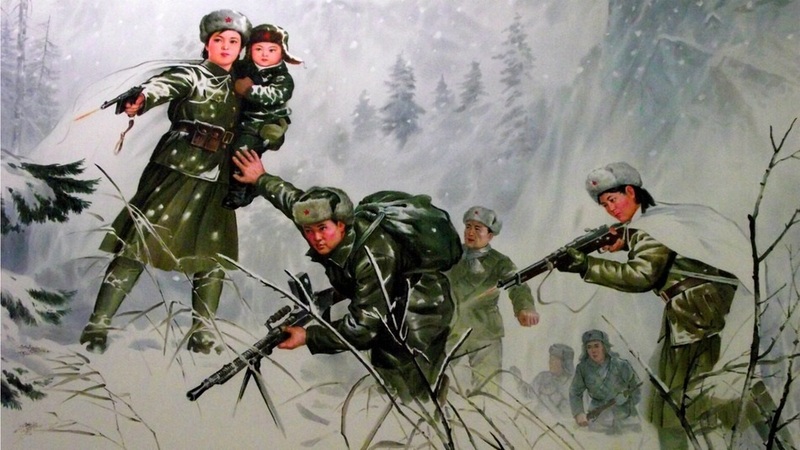 This moment is categorised in hagiographies of Kim Jŏng-suk and conventional North Korean histories as the moment of “Becoming a Human Fortress and a Shield”, echoing the status of Paektu as “natural fortress” (Kim Il-sŏng 1992) Having, counter to conventional military strategy, attacked uphill, and engaging with Japanese forces high up in the mountains, the guerrilla band was subject to a counter attack. The narrative describes the events as following: “Kim Il-sŏng commanded the battle from a rock on the ridge of the mountain. Mindful of his safety, Kim Jŏng-suk kept a close watch on the surroundings. Noticing reeds swaying strangely, she turned her eyes and saw half a dozen enemy soldiers hiding in a reed field, taking aim at Kim Il-sŏng on the ridge…at the hair-raising moment, Kim Jŏng-suk raced to Kim Il-sŏng, shouting “Comrade Commander!” and shielding him with her body. Then she pulled the trigger of her Mauser. The enemy soldier in the front fell down, dropping his gun. A gunshot followed. Kim Il-sŏng had shot over her shoulder. In this way they both shot all the enemy soldiers in the reed field dead…” (Biography 2002: 165). “Women of Korea” was an English language journal published by North Korean Foreign Languages Publishing House focused on the lives of North Korean women. In common with many North Korean publication series and journals no individual authors are credited. Accordingly the author ascribes authorship simply to “Women of Korea”. The “revolutionary” battlefield sites on and around Mt. Paektu have spawned a considerable North Korean tourist industry and accompanying tourist architecture. These sites are discussed at length by scholars such as Christopher Richardson (2014) and in particular by Benoit Berthelier (2014). Berthelier addresses current historical scholarship which views much of the guerilla campaigns undertaken by Kim Il-sung and Kim Jong-suk, as real historical events located elsewhere, in the border regions of colonial Manchukuo and Chosŏn. Thus formulated moral and social obligations show that women were traditionally included among the subjects of virtue in East-Asia.